DIGMALL BT-2801 USB Bluetooth Transmitter plug and play is very handy device. ■ It can easily adds Bluetooth function to your PC, TV, DVD/CD players, iPod and other audio source devices with USB or 3.5mm or 2.5mm RCA R/L jack. ■ It enables your audio devices to communicate with your Bluetooth headphones, speakers, amplifier, sound-bar. ■ Ideal for watching TV，movies or gaming but not disturbing others, listen to music at anywhere and anytime. ■ Advanced CSR Bluetooth chipset Fast Stream features minimizes latency and enables you to enjoy Hi-Fi Sound Quality. ■ Not Built-in Battery, But it can Keep always playing when you only stay this Bluetooth Transmitter USB powered by TV/PC or Power bank or USB charger etc. ■ No Button Design, once USB powered, it enter into pairing at once or re-connection to paired devices. 1.The latency of 90ms is still unacceptable for live performance. Therefore, musicians beware! This item may not suit your needs. You can search DIGMALL BTI-0I8 or BTI-038 with apt-X Low Latency. 2.This Bluetooth Transmitter only can pair to your Bluetooth Headphones/Speakers, not be paired to your smartphone, If you need one Bluetooth Receiver, please search DIGMALL BTI-030 or J205. 3.This Bluetooth Transmitter can't support Dual Link. 4.When you plug this item into PC, the USB port is for power supply, also for audio and you can see "CSR Audio Adaptor" displayed for audio channel. For other devices, such as TV, please connect it to TV via audio cable. 【Ideal for Wireless Home Entertainment】: DIGMALL USB Bluetooth Transmitter(not a Bluetooth receiver), connect to audio output devices such as TV, iPod, CD player, PC, MP3/MP4, and transmit audio to your Bluetooth stereo, headphones and speakers, It makes a perfect choice to suit all your needs. Its compact size and deluxe USB look makes it fit very well with your home audio system. 【No Driver Needed】: You can plug and play this transmitter easily and no need any other driver software, powered by USB, there is also no time limit. 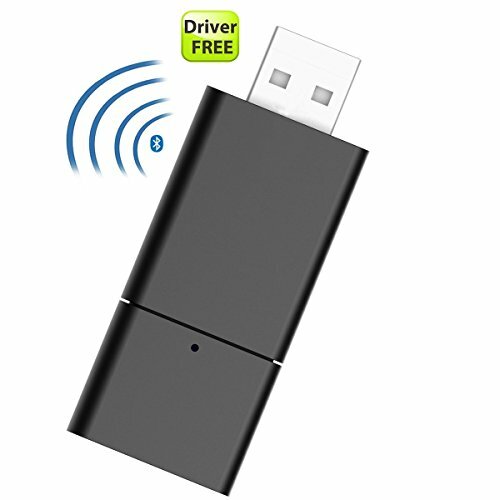 【User Friendly】: This Bluetooth transmitter can transmit a high definition distance for 33ft/10M,You can enjoy clear stereo music freely.NO Button Design, Easy to Setup. 【Delete the Paired Lists】: The product features memory function, if you want to remove the previous devices and delete the paired lists, long press the Delete button for about 8 seconds using the included metal rod after the product is turned on. 【What You Get】: DIGMALL Bluetooth Transmitter, 3.5mm Audio Cable, 2.5mm Audio Cable 12-Month Product Quality Warranty & 30-Day Money Back Guarantee and Lift-time Technical Support within 24 hours.